At least somebody in the know finally said it. See? The stadium is a selling point, too. We've discussed this before (most notably, with the Heart of Dallas Bowl) but it bears repeating that the Cotton Bowl is all that is wrong with college football bowl games. Let's first start with the facts. 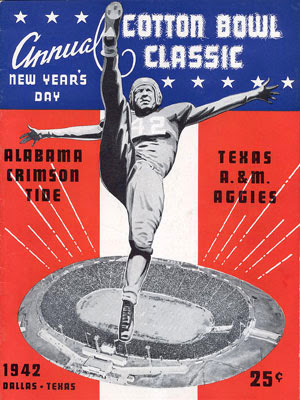 For 60 years: The Cotton Bowl is played at the Cotton Bowl. On New Year's Day. In the bright Texas sunshine. Now: The Cotton Bowl is played at the new billion-dollar Jerry Jones Memorial Mausoleum. After New Year's Day. At night, with the roof closed. The part that really chaps me is that the Cotton Bowl isn't at the Cotton Bowl. Do you realize that the Rose Bowl is now the only bowl that's called the ______ Bowl and is actually played in a stadium called the ____ Bowl? There's still the Gator Bowl, but the original Gator Bowl Stadium got torn down. The Orange Bowl got moved to Dolphins Stadium years ago and they tore down the Orange Bowl Stadium a couple years back The game they play in the stadium called the Citrus Bowl is not called the Citrus Bowl anymore. (You can't even find it on the logo.) And then there's this. The Cotton Bowl stadium still exists but doesn't host a bowl game called the Cotton Bowl anymore. 31 bowl games in, it's hard for me to get frustrated at how much a blatant money grab all bowl games are. But really, anything associated with Jerry Jones just seems worse. I know we're all chasing the dollar in some form or another. Dude's gotta eat. But there are ways to do it that don't involve looking like a jerk. Jerry Jones has not found those ways. This game is guaranteed to be interesting because of the Gus Johnson Factor. You know what that is, right? Seems like every game Gus Johnson broadcasts, it's a nail-biter even when it shouldn't be. Gus really nailed this down while doing the NCAA tournament for CBS. 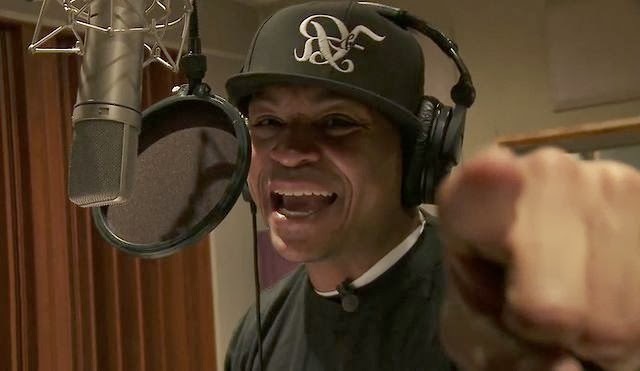 The game that solidified Gus' reputation in this regard was the UCLA comeback against Gonzaga in the 2006 Sweet 16, where Adam Morrison cried at the end. I didn't realize what the fuss was about originally, because I didn't hear Gus call the game- I was there. It was a fascinating game to watch, even without Gus. Though UCLA was down by as many as 17 in the first half, I could sense they weren't out of it. (I said as much at the half to people who can verify this.) Everything they had to do to come back, they did. Anyway, Gus will make this game watchable and more interesting than it should be. It'll be interesting anyway because, of course, Oklahoma State and Missouri were in the same conference till Mizzou bailed for the cash grab that is the SEC. I want to pick Oklahoma State, especially after what Oklahoma did to Alabama last night, but it hurts me as a Kansas alum to say I think Mizzou should win it. I watched Okie State have a chance to win the Big 12 straight up against Oklahoma and blow it, and then I watched Mizzou play a much tougher game against Auburn in the SEC title game than anybody expected. Past performance is not an indicator of future results, especially when you have a month to prepare for a team. I would not be at all surprised if Mike “I'M A MAN!” Gundy has his team ready to go and they win. But they shouldn't. Reluctantly, I pick Mizzou here, and will be very glad if I'm wrong. This game bugs me. Mainly because I am still having issue accepting Missouri being in the SEC. I am surprised that The Dude didn't have more to say on that topic. (Wait 'till the NCAA tournament pairs KU and Mizzou up- Dude) A couple of years ago, this is nothing more than a good early November conference game at a neutral site. Now, it's the Cotton Bowl of Arlington brought to you by Jerry Jones. What a load of crap. Move this MSC of a game to Arrowhead Stadium, call it the Revisionists History Bowl, and move on. I'll take the Pokes, even if just on principle. Another seeming BCS mismatch. Of course the rest of them so far have worked out for the team not given a chance. First UCF, then Oklahoma. Will Clemson continue the trend? You know, there's a chance they could. Ohio State has given up boatloads of points recently, and Clemson can score boatloads of points. Ohio State can run, and Clemson can throw. Really, with a month off anything can happen. I just think this might be the game where some all-time scoring records are in jeopardy. I wouldn't mind seeing Clemson continue the upset trend, but.... mmmmm...... arrrgh. Ah, the heck with it. I'll go with them now and regret it by halftime. Besides, who wouldn't like to see Alabama and Ohio State each lose two straight, and in consecutive days, no less? The more I think about this, the more I realize I shouldn't be mad at the Cotton Bowl. 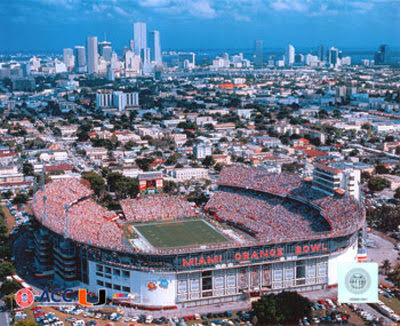 The Orange Bowl was one of the the first bowls to move out to a bigger, gaudier stadium when the old place still existed. Oh well. I'm still going to blame it all on Jerry Jones. Mmm....Miami. The land of mocha milk and honey. If slipping over the boarder for a nip in El Paso was a distraction for UCLA and Virginia Tech, the prospect of slipping out for a night on the town in the land of the beautiful people is going to prove disastrous for Clemson & Ohio State. So, after being sequestered in their hotel leading up to the game, these two teams should hit the arena like a couple of prized bulls. After the way Michigan State totally dominated Stanford in the Rose Bowl, the Big-10 will view this as a very successful post-season if the Buckeyes win. As South Park's Mr. Mackey would say, that would be bad, m'kay. What would all those talking heads on TV and radio shout about if not about how the Big-10 is slow and not on level with the athleticism of the other conferences? What if the Michigans and the Ohio States of the world are correct and the Big-10 really is the center of the college football universe? Could Pac-12 fans stomach that? Would that cause an all out SEC rebellion? This game is suddenly taking on much more importance that just being one of the last exhibitions before the real game on Monday. We all need Clemson to win to keep national security in order. Hey all you Civil War reenactors, how's that for irony? Go Tigers, save the Union! !